There is a terrible relationship, built up over centuries, between American politicians and shmaltz, by which I mean smarmy sentiment. This is from Obama’s book, The Audacity of Hope, which is full of the same kind of rhetoric. No wonder he can’t achieve anything in Washington if this is his kind of sales pitch—for that is a place where the blessings of God are avidly sought. At the antipodes of Obama’s absurd incapacity to handle realpolitik is Bill Clinton. Mr. Clinton was one of the best horse traders ever to reach the White House, and agree or disagree with him, he got things done. So it is not surprising that President Clinton’s new book is also the polar opposite of Obama’s shmaltz—President Clinton has written a down-to-earth, practical handbook on what he thinks government needs to do to get the economy up and running again. President Clinton offers straightforward policy options, supported by statistics and documentation—and what a welcome bit of refreshment this is amid the welter of ad hominem attacks and mindless rhetoric that dominate this presidential campaign. The book is mercifully free from rhetoric and shmaltz. It is a kind of list of policy steps that Clinton believes must be made. While unashamedly partisan—President Clinton takes the opportunity to get in some good shots at his Republican opponents—he appears more interested in policy than in politicking. Since Reagan, the debate changed, and government itself took the blame. And the Tea Party conservatives are determined to reduce the size of government, regardless of the consequences. Anyone who listened to Ron Paul’s 2012 speeches in Iowa—the man must have been born with shmaltz instead of blood in his veins—might feel sympathetic to President Clinton’s view. But there are, after all, intellectually respectable Tea Party conservatives, who simply want to recreate America in the image of Victorian England. There, a small ruling class had all the money, all the health care, and all the advantages. The rest of the people had “freedom.” If this is the kind of country we want, there is, at least, excellent historical precedent. President Clinton says that the “evidence,” shows that we have created and can sustain a better system, and like a good lawyer he builds a case, arguing for the judge and not to the jury. He admits that the Dems ran a lousy campaign in the 2010 Congressional elections. The economy wasn’t getting better, and the ruling party didn’t address the challenge. President Clinton takes up the challenge, reminding us of what happened during the Bush Administration when spending on wars abroad was accompanied by tax cuts—for the first time in U.S. history. It was then that the government began borrowing money, financing debt with treasuries, and the national debt quadrupled from 1981 through 1992, then doubled again between 2001 and 2009. All of Obama’s spending after the financial crisis was about a third of what Bush ran up in debt, as author Clinton shows with detailed statistics. Meanwhile, health care costs spiraled, at three times the rate of inflation between 1981 and 1993, and again between 2001 and 2009. It can hardly be argued that cutting taxes and spending, and shifting to a system where senior citizens have to use vouchers for health care, is going to get the country working again. President Clinton points out exactly what government pays for and does today: national security, assistance to the seniors and the disadvantaged, aid for education, and stimulus for economic development. The government regulates the environment so that we get clean food and water, and the markets so that at least theoretically, we get a level playing field for the economy. What are the big spenders? Again, President Clinton provides statistics to show that its Medicare, Medicaid, Social Security, the defense budget, and interest on the debt account for 85% of the entire federal budget. Only the remaining 15% goes to education, research, and regulation. So where to cut? Cut where the money is, President Clinton explains, but do it in ways that don’t damage our future. He approves of the defense cuts which had been planned at the time of the book’s publication, but which have since been implemented by the administration. Bill Clinton wants to raise the cap on Social Security, and to make the top 1% of earners in the country to pay about 1% more than the rest—he points out that those with the highest salaries have had significant gains in the past 10 years, while the rest of the workforce lost out. With other tweaks, we could save $200 billion from the national debt in the next ten years. As for Medicare and Medicaid, President Clinton presents some telling numbers. “In 2009, in the depths of the recession, insurance companies raised their rates so sharply that their profits increased 56% while most Americans were worried about going broke. As a result, five million people lost their health coverage, and more than three million of them became eligible for Medicaid. That drove up the federal deficit even more. Whereas, simple reforms to these programs could save billions, Mr. Clinton points out. While the proposed voucher system simply shifts cash flow onto the seniors themselves, thus hurting those who have little to spare, while having no affect whatsoever on the cost of healthcare. Medicare is already less costly than private insurance, Mr. Clinton explains. Making seniors pay for it upfront, and getting the money back later, simply increases office work. Since Medicare, spending person has only increased 400% since 1970, while private insurance has increased 70%, it isn’t logical to push more costs into the private sector. President Clinton goes into much greater detail in this debate than we do here, and his documented views are welcome, even if one doesn’t agree with them. They raise the debate above the shmaltz level. In a really shocking chapter, he unrolls a whole bandeau of statistics that show just how quality of life, education, and economic power have declined in the U.S. in the past 20 years. Greece has a higher rate of high-school graduations. Portugal has an economy with less inequality. Even the Czech Republic ranks higher in terms of the Gallup Global Wellbeing Index. Not to mention poor scores in almost every category of the modern economy. President Clinton goes on to make an extremely detailed list of 46 steps government could take to make our society and our economy function better. Each one merits consideration—even if one eventually rejects the arguments, the creation of critical dialogue around these topics is welcome. 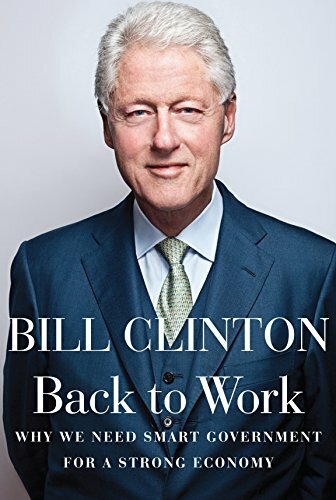 William Jefferson Clinton’s Back to Work is a good antidote to the shmaltz epidemic—enough already.